"Two kingdoms" redirects here. For the kingdoms of England and Scotland, see History of the formation of the United Kingdom. The two kingdoms doctrine is a Protestant Christian doctrine that teaches that God is the ruler of the whole world, and that he rules in two ways. The doctrine is held by Lutherans and has historically been the view of Calvinists, though neo-Calvinists have a different view called transformationalism. The two kingdoms doctrine is simply another form of the distinctive Lutheran teaching of Law and Gospel. The official book that defines Lutheranism, the Book of Concord compiled in 1580, references a sermon by Martin Luther on this from 1528 preached on the 19th Sunday after Trinity in Marburg, about the Two Kingdoms or Two Kinds of Righteousness. In that sermon he states that the worldly (left hand) Kingdom includes everything we can see and do in our bodies. This fully and especially includes whatever is done in the church. This is taught so that it is clear that in the Heavenly (right hand) Kingdom, the only thing that is included there is alone faith in Christ. "Christ alone" and "faith alone" are Lutheran slogans that are reflected in this way. The biblical basis for this doctrine, as with all Law and Gospel modalities is the distinction St Paul makes in Romans 8 between "flesh/body" versus "spirit/Spirit". Martin Luther's breakthrough moment was his break with the traditional scholastic understanding of this passage. The Scholastics understood flesh vs spirit to be the movement from vice to virtue, from the profane/secular/civil to the sacred/churchly. Luther saw this contrast instead to be a movement from true virtue, which especially included the sacred and churchly and any righteousness we can do or that is visible, to alone the invisible righteousness of faith in Christ, which in the sermon referenced here he says is "meaningless on earth except to God and a troubled conscience." Martin Luther used the phrase "two governments" rather than "two kingdoms." His and Philip Melancthon's doctrine which was later labeled "two kingdoms" was that the church should not exercise worldly government, and princes should not rule the church or have anything to do with the salvation of souls. Augustine's model of the City of God was the foundation for Luther's doctrine, but goes farther. Luther was confronted with seemingly contradictory types of statements in the Bible. Some biblical passages exhort Christians to obey rulers placed over them and to repay evil with retribution, but others, such as the sermon on the mount, call for passivity in the face of oppression. 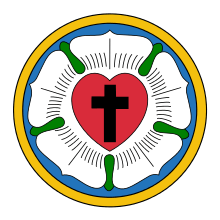 Luther reconciled these and in doing so took a middle course between Roman Catholics, who saw the second type of biblical statement as a sort of ideal for a more perfect class of Christian, and radical Christians who rejected any temporal authority. Instead, Luther taught that the world is divided into true Christians and non-Christians, and that the sword is necessary to restrain evil committed by non-Christians. The spiritual kingdom, made up of true Christians, does not need the sword. The biblical passages dealing with justice and retribution, therefore, are only in reference to the first kingdom. Christians, however, should only use the sword against evildoers, and never amongst themselves. Luther also uses this idea to describe the relationship of the church to the state. The temporal kingdom has no authority to coerce in matters pertaining to the spiritual kingdom. Luther had in mind the way in which the Roman Catholic Church had involved itself in secular affairs, and prince's involvement in religious matters, especially the ban on printing the New Testament. God has ordained the two governments: the spiritual, which by the Holy Spirit under Christ makes Christians and pious people; and the secular, which restrains the unchristian and wicked so that they are obliged to keep the peace outwardly… The laws of worldly government extend no farther than to life and property and what is external upon earth. For over the soul God can and will let no one rule but himself. Therefore, where temporal power presumes to prescribe laws for the soul, it encroaches upon God's government and only misleads and destroys souls. We desire to make this so clear that every one shall grasp it, and that the princes and bishops may see what fools they are when they seek to coerce the people with their laws and commandments into believing one thing or another. We are to be subject to governmental power and do what it bids, as long as it does not bind our conscience but legislates only concerning outward matters… But if it invades the spiritual domain and constrains the conscience, over which God only must preside and rule, we should not obey it at all but rather lose our necks. Temporal authority and government extend no further than to matters which are external and corporeal. Due to the influence of neo-Calvinism, it is commonly believed that the Reformed have historically held a significantly different view, known as transformationalism, from the two kingdoms doctrine. In fact, however, Calvin as well as later Reformed orthodox figures clearly distinguish between God's redemptive work of salvation and earthly work of providence, they maintain that he works differently in each kingdom, and they see his redemptive work as within the realm of the church while his earthly work is in the realm of civil authorities. Scottish theologian Andrew Melville is especially well known for articulating this doctrine, and the Scottish Second Book of Discipline clearly defined the spheres of civil and ecclesiastical authorities. High orthodox theologians such as Samuel Rutherford also used the concepts and terminology of the two kingdoms. Francis Turretin further developed the doctrine significantly by linking the temporal kingdom with Christ's status as eternal God and creator of the World, and the spiritual kingdom with his status as incarnate son of God and redeemer of humanity. The Reformed application of the doctrine differed from the Lutheran in the matter of the external government of the church. Lutherans were content to allow the state to control the administration of the church, a view in the Reformed world shared by Thomas Erastus. In general, however, the Reformed followed Calvin's lead in insisting that the church's external administration, including the right to excommunicate, not be handed over to the state. Luther's articulation of the two kingdoms doctrine had little effect on the practical reality of church government in Lutheran territories during the Reformation. With the rise of cuius regio, eius religio, civil authorities had extensive influence on the shape of the church in their realm, and Luther was forced to cede much of the power previously granted to church officers starting in 1525. In Geneva, however, Calvin was able, after significant struggle, to establish under the Ecclesiastical Ordinances a form of church government with much greater power. Most significantly the Genevan Consistory was given the exclusive authority to excommunicate church members. James Madison, the principal author of the First Amendment to the U.S. Constitution, explicitly credited Martin Luther as the theorist who "led the way" in providing the proper distinction between the civil and the ecclesiastical spheres. There is a twofold society, of which almost all men in the world are members, and from that twofold concernment they have to attain a twofold happiness; viz. That of this world and that of the other: and hence there arises these two following societies, viz. religious and civil. The Catholic Church has a similar doctrine called the doctrine of the "two swords," in the papal bull Unam Sanctam, issued in 1302 by Pope Boniface VIII. In this bull, Boniface teaches that there is only one Kingdom, the Church (here meaning the Catholic Church), and that the Church controls the spiritual sword, while the temporal sword is controlled by the State, although the temporal sword is hierarchically lower than the spiritual sword, allowing for Church influence in politics and society at large. The Coptic Church has traditionally avoided political power, and has never allowed itself to control the government of Egypt. 1 2 3 VanDrunen 2007. ↑ "Section 9, Article VI. The Third Use of the Law", Formula of Concord . ↑ Marburg sermon (full text), OR Lutheran . ↑ Luther (1900), Werke [Works], XI (St. Louis ed. ), Third use, p. 1726ff . 1 2 MacCulloch 2003, p. 157. ↑ Gritsch 1986, p. 48. ↑ MacCulloch 2003, p. 164. ↑ MacCulloch 2003, p. 238. ↑ Madison (1821), To Schaeffer (Books) (scan), Google . ↑ Locke, John, On the Difference between Civil and Ecclesiastical Power (Books) (scan), Google . ↑ "Encyclopedia Coptica". Egypt: The Christian Coptic Orthodox Church. Gritsch, Eric W (1986), Tracy, James D, ed., "Luther and the Modern State in Germany" (Questia), Sixteenth Century Journal, Kirksville, MO |chapter= ignored (help). MacCulloch, Diarmaid (2003), The Reformation: A History, New York: Penguin . VanDrunen, David (Autumn 2007), "The Two Kingdoms Doctrine and the Relationship of Church and State in the Early Reformed Tradition", Journal of Church and State, KC library, 49 (4): 743–63, doi:10.1093/jcs/49.4.743 – via EBSCO (subscription required) . The two ‘Kingdoms’ (PDF), AU: Lutheran Church, Commission on Social and Bioethical Questions, 2001 .